This Contest Ended on June 30, 2010. You cannot enter any more. Krystle S. from Mammoth Lakes, CA was the winner of this contest, winning a brand-new Apple iPad Wi-Fi 16GB. Recently, we gave away a Dell XPS 16 laptop, an Apple iPod Touch and a Sony Cybershot S2100 12.1 MP Digital Camera to a these winners: Theresa, Bonnie, and Linda. 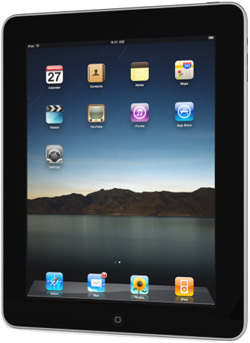 Win a brand-new Apple iPad from BestOnlineCoupons.com in our current contest. Entering this contest is easy and free. Simply submit a review of a merchant listed on this website to enter. This contest is one way to reward people for helping fellow shoppers by posting true reviews of online stores and Internet services. Share your shopping experiences on our online coupon codes site and help BestOnlineCoupons.com's visitors by providing them with real store reviews. Each quality review submitted between May 3, 2010 and June 30, 2010 is an entry into the contest. One review submitted during this time period will be randomly selected as the winner. Enhance your odds of winning by submitting reviews of all the the online stores and Internet services you personally know about. Please keep your reviews as accurate, honest, useful, and thorough as possible, and do not review the same merchant multiple times. In your review you can simply describe whether or not you like a merchant and include all the reasons why. Be as detailed and helpful as possible, including decriptions of relevant experiences you had with the merchant, any problems encountered, and how they were resolved. Remember to review merchants you like, and not just right complaints about the ones you've had problems with. The contest prize is a brand-new Apple iPad. This particular model is the Wi-Fi 16GB edition. The Apple iPad is the hottest gadget to come out in quite a while, and is a great way to browse the internet, send email, view videos, watch YouTube, play music, browse iTunes, shop the App Store, read books, read magazines, read newspapers, use maps, keep your contacts, maintain a calendar, write notes, and more. Pictured here is the racing game Asphalt 5, just one of the thousands of games available to play on the ipad. To submit a review for a particular merchant, first search for the store. If your store is on the search results list, click the Reviews link for that store. On the page you will see the current reviews for that store and a link to add your own review. After submitting your review, you can repeat the process for another store. If you submit an original, complete, accurate and useful review, it will count as an entry in the contest. Any submission that is SPAM, is not a review, isn't in English or doesn't make any sense will not be published (or will be unpublished once it is noticed.) Any submissions that are not published will not be eligible for the contest. Also, reviews that are too short (i.e. just one line), are copied from any other site (Copyscape will be used to check this), or are determined not to be useful by BestOnlineCoupons.com at its sole discretion will not be eligible to win this contest. If you don't win, maybe you'll want to buy an Apple iPad? There are not many places that are selling them online yet, but more will start soon. For now Apple Store and BestBuy.com are selling them, so check our coupon pages for these stores: Apple Store and Best Buy. To Enter. To enter BestOnlineCoupons.com users ("Participants") must submit a complete, unique review of a merchant on the BestOnlineCoupons.com Web site. Eligibility. The contest is open to legal residents of the United States age 18 years or older. Timing. The contest starts at 12:01 AM CST on May 3, 2010. The contest ends at 11:59 PM CST on June 30, 2010. All reviews must be submitted during this time period to qualify as entries into the contest. Selection of Winner. On or about July 1, 2010, one potential winner will be selected by randomly choosing one of the published reviews. If that person and the review meet the elgibility criteria, they will be awarded the prize. If their email address is not valid or they do not respond to the notification within seven (7) days, the prize award will be rescinded. This procedure will be repeated as necessary until there is one (1) eligible winner that has claimed the prize. Prizes. One (1) prize will be awarded. The approximate retail value of the prize is $500. No prize substitution, cash redemption, assignment or transfer of prizes by winner is permitted. We reserve the right to substitute a prize with another prize of equal or greater value. Limit of one prize per person. Publicity. The winner will be asked to submit a response for winning, send digital pictures of their prize and related information. Any and all text, photographs, video or other media taken or collected, will be the exclusive property of BestOnlineCoupons.com. Except where prohibited, participation in the Contest constitutes Participant's consent and permission to use, copy, edit, and broadcast, in whole or in part, all such material without further payment or consideration to Participant. Release. BestOnlineCoupons.com and its owners, officers, employess, promotional and advertising agencies, agents, representatives and counsel shall have no liability for, and by entering, Participant agrees to hold harmless and indemnify BestOnlineCoupons.com against, any injuries, losses, damages or causes or action resulting in whole or in part, directly or indirectly, from the acceptance, possession, use or misuse of prize or Contest participation. Limitations of Liability. BestOnlineCoupons.com is not responsible for: technical hardware, software, or computer failures of any kind, lost or unavailable network connections, fraud, incomplete, garbled or delayed computer or fax transmissions, whether caused by BestOnlineCoupons.com, participants, users, or by any of the equipment or programming used in the promotion or by technical or human error which may occur in the administration of the Contest or the processing of entries; late, lost, undeliverable, incomplete, incorrect, misdirected, damaged or stolen mail; or (3) any injury or damage to persons or property which may be caused, directly or indirectly, in whole or in part, from entrant's participation in the Contest or receipt or use or misuse of any prize. No more than the stated number of prizes will be awarded. Disputes. Any and all disputes, claims, and causes of action arising out of or connected with this Contest, or any prizes awarded, shall be resolved individually, without resort to any form of class action, and exclusively by the San Diego Superior Court, San Diego, California. Any claims, judgments or awards shall be limited to actual out-of-pocket costs incurred, including costs associated with entering this Contest but in no event attorneys' fees. Under no circumstances will Participant be permitted to obtain awards for, and Participant hereby waives all rights to claim, punitive, incidental and consequential damages and any other damages, other than for actual out-of-pocket expenses, and any and all rights to have damages multiplied or otherwise increased. All issues and questions concerning the construction, validity, interpretation and enforceability of these Rules, or the rights and obligations of Participant and BestOnlineCoupons.com in connection with the Contest shall be governed by, and construed in accordance with, the laws of the State of California without giving effect to any choice of law or conflict of law rules or provisions (whether of the State of California or any other jurisdiction), which would cause the application of the laws of any jurisdiction other than the State of California. Over the years BestOnlineCoupons.com has been a leading resource to find online coupons, promo codes, clearance sales, discount promotions and deals for the best online stores. Recently we began collecting real customer reviews to enhance our services. Now when you visit Best Online Coupons, not only can you find great online coupon codes to save money, you can also find the best places to shop online based on real customer reviews and ratings, so you can save time and prevent hassles as well. Plus, by submitting your own merchant reviews, you can have a chance to win a brand-new Apple iPad.